Objective: To investigate change of pepsinogen I (PG I), pepsinogen II (PG II) and gastrin-17 (G-17) in different gastric diseases and to determine the value of PG and G-17 in screening and diagnosis of early gastric cancer. Methods: All patients were divided into 5 groups, non-gastric atrophy group, gastric atrophy (GA) group, peptic ulcer group, non-early gastric cancer group, early gastric cancer group. 90 healthy individuals were recruited as the control group. Using Enzyme Linked Immunosorbent Assay (ELISA) to determine expression of PG I, PG II and G-17 in difference groups of patients. ROC curve was used to determine the diagnostic value of PG I, PG II, G-17 and PRG. The value of PG I, PG II and G-17 in screening and diagnosis of gastric cancer was analyzed through statistical methods. Results: Results showed that expression of G-17 and PG I all showed significant difference compared with the control group, P<0.05. Among the indexes, G-17 showed highest specification and sensitivity. However expression of PG II and the ratio of PG I/PG II (PRG) were not significantly different from the control group. All G-17 and PG II showed good sensitivity and specificity in the gastric cancer group. However PRG and PG I showed lower sensitivity and specificity compared with other markers. In early gastric cancer group, G-17 demonstrated high sensibility and specificity which were significant higher than other indexes. Combination of G-17 and PRG showed significant high sensitivity and accuracy in screening of gastric cancer which could enhance the sensitivity to 96.2%. Conclusion: G-17 and PG can be potent markers in screen of diagnosis of gastric cancer, especially for early cancer. G-17 combined with PG can improve the sensitivity and accuracy of the diagnosis of gastric cancer. Gastric cancer (GC) is a serious threat to human health. It is one of the most common malignant tumors of digestive tract . Although with the development of the basic medical and clinical treatment, the morbidity and mortality of gastric cancer decreased gradually, but in recent decades, the global annual increase in more than one million cases still ranked . Because of non-invasive, simple and low cost, PG I, PG, and G-17 serological detection has been widely applied in many countries [3-7]. Gastrin was first discovered by Edkins in 1906, and there are many subtypes of gastrin, of which G-17 is the most abundant (about 90%). Rakic et al. found that the serum gastrin levels in patients with gastric cancer changed . Ghee et al. 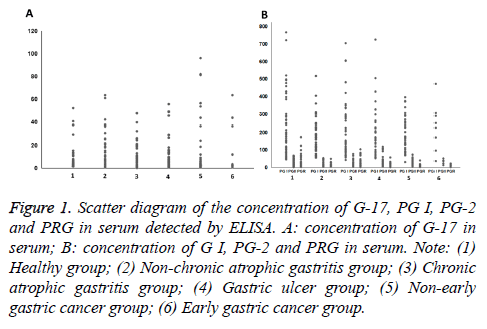 detected Helicobacter pylori in patients with ELISA and the results showed that high level of G-17 could promote the occurrence and development of gastric cancer . Zhuang et al. have shown that gastrin could promote the migration of gastric cancer cells through the β-catenin/tcf-4 pathway . Kikuchi et al. showed that the high expression of G-17 and low expression of PG I and PG II could be used as the basis for early gastric cancer screening . However, there are some drawbacks in each conventional technique for each sole marker has its limitation and can’t give the satisfying results. Moreover, the association between the combined detection of serum gastrin-17 plus pepsinogen and gastric cancer is still unclear. In this study we discussed the clinical value of PG I, PG II and G-17 in the diagnosis and differential diagnosis of gastric cancer to improve the diagnostic precision of gastric cancer. In this study, a total of 192 patients with gastric diseases were selected, including early gastric cancer, non-early gastric cancer, gastric ulcer, chronic atrophic gastritis, chronic atrophic gastritis. ELISA was used to detect the concentration of PG Ⅰ, PG Ⅱ and G-17, recording the changes of PG, PG Ⅱ and G-17 in benign and malignant gastric diseases. This cross-sectional study was done in Dongtai Hospital Affiliated to Medical College of Nantong University of China during 2010-2011. A total of 192 patients with gastric diseases were selected. All patients were divided into five groups: early gastric cancer group; non-early gastric cancer group; gastric ulcer group; chronic atrophic gastritis group; non-chronic atrophic gastritis group, and 90 healthy people were selected as the control group (Table 1). Table 1. Demographic characteristics in study groups. All patients signed consent forms before treatment. ELISA was performed using 96 well microtiter plates (Nunc) that were coated with 50 μL/well of different substrates diluted in coating buffer (100 mmol/L Na2CO3/NaHCO3, pH 9.6). After overnight incubation at 4°C, the coated wells were washed three times after which the nonspecific binding sites were blocked with 1% Bovine Serum Albumin (BSA) in PBS for 1 h at 37°C. All subsequent detection antibodies were diluted in PBS containing 0.05% Tween-20 and 1% BSA (PBS-T-BSA) unless otherwise stated, and each step was followed by washing three times using PBS-0.5% Tween-20. Subsequently, the serum was incubated at indicated dilutions for 1 h at 37°C. After washing, bound C3c was detected using diluted rabbit polyclonal anti-human PG I (PG II or G-17) antibodies (Abs) (Shanghai Long Island Biotec. Co., Ltd. D-3004), followed by Horseradish Peroxides (HRP)- conjugated anti-rabbit Abs (Shanghai Long Island Biotec Co., Ltd., P-0047) diluted in PBS-T-BSA, for 1 h at 37°C respectively. Enzyme activity of HRP was assessed by addition of o-phenylene-diamine and H2O2. After 15-30 min the reaction was stopped by addition of 50 μL of 1 mol/L H2SO4 per well. OD was measured at 450 nm using a microtiter plate reader (Multiskan FC, Thermo Scientific). The results were entered into computer using SPSS 18 statistical software and analyzed by chi-square, t-test. Receiver operating curve (ROC) analysis was used to determine the cutoffs for PG I, PG I/II ratio and G17. A p value less than 0.05 is considered as significantly different. Sensitivity and specificity of these markers to distinguish the above mentioned groups (non-atrophic gastritis, GA, and GC) were calculated. Positive Predictive Value (PPV), Negative Predictive Value (NPV), Area under Curves (AUC) and the 95% Confidence Intervals (CI) were also calculated and presented. The results show that the non-early gastric cancer in patients with G-17 and PG I expression are significantly different with the healthy group (P<0.05). PG II and PRG expression are not significant compared with healthy group (p>0.05). The expression of PG I in all patients had significant difference compared with healthy group, (p<0.05) (Figure 1 and Table 2). Figure 1: Scatter diagram of the concentration of G-17, PG I, PG-2 and PRG in serum detected by ELISA. A: concentration of G-17 in serum; B: concentration of G I, PG-2 and PRG in serum. Note: (1) Healthy group; (2) Non-chronic atrophic gastritis group; (3) Chronic atrophic gastritis group; (4) Gastric ulcer group; (5) Non-early gastric cancer group; (6) Early gastric cancer group. Note: aP<0.05, Compare to healthy group; bP<0.05, Compare to non-early gastric cancer group; cP<0.05, Compare to early gastric cancer group. Table 2. The concentration of G-17, PG I, PG II, PRG in serum. The results show that when the concentration of G-17>3.119 pmol/l as cut-off points the sensitivity was 84.6%, false positive rate was 26.7%. When the concentration of G-17<2.053 pmol/l as cut-off points, the sensitivity was 76.7%, false positive rate was 23.1%, the area under the ROC curve (AUC) is 0.797, 95% curve of the confidence interval 0.721-0.873, p=0.000. When the concentration of PG I<88.15 ug/l, the sensitivity was 74.7%, false positive rate was 24.4%, AUC is 0.724, 95% curve of the confidence interval 0.741-0.861, p=0.000. When the concentration of PG II>18.68 ug/l as cut-off value, the sensitivity was 61.5%, false positive rate was 34.4%, the AUC is 0.783, 95% curve of the confidence interval 0.578~0.787, p=0.034. When the PRG<7.61 as cut-off value, the sensitivity was 76.8%, false positive rate was 25.8%, the AUC is 0.733, 95% curve of the confidence interval 0.538-0.728, p=0.005 (Figure 2 and Table 3). Figure 2: The ROC curve of G-17, PG I, PG II and PRG in early and non-early gastric cancer group detected by ELISA. (A) The concentration of G-17>3.119pmol/l; (B) The concentration of G-17<2.053pmol/l; (C) The concentration of PG I<88.15 ug/l; (D) The concentration of PG II>18.68 ug/l; (E) PRG<7.61. Table 3. Indices of validity for serum levels of pepsinogen I (PG I), PG I/II Ratio and Gastrin-17 (G17) to distinguish gastric cancer, nonearly gastric cancer and early gastric cancer. The diagnostic results of G-17 and PRG results were analyzed by using Spearman rank correlation method (Table 4). The results showed small correlation coefficient between G-17 and PRG (P>0.05), a complementary diagnostic value for gastric cancer. All patients with gastric cancer, three indicators combined detection results are shown in Table 5, diagnostic sensitivity can be increased to 96.2% combined detection of G-17 and PRG. Table 4. Correlation analysis between G-17, PG I and PRG. Table 5. The combined detection of G-17 and PRG in the diagnosis of gastric cancer complementary diagnostic value. The aim of this study was to evaluate the accuracy of serum levels of PG and G17 as non-invasive screening methods for GC. Regarding the clinical importance of GA and GC, we mainly focused on assessing indices of validity of these markers to distinguish GA/GC patients. ELISA was used to detect the content of PG-I, PG-II and G-17 in gastric diseases patients and healthy people. The results showed that expression of G-17 and PG I all showed significant difference compared with the control group, P<0.05. Among the indexes, G-17 showed highest specification and sensitivity. However expression of PG II and the ratio of PG I/PG II (PRG) were not significantly different from the control. All G-17 and PG II showed good sensitivity and specificity in the gastric cancer group. However PRG and PG I showed lower sensitivity and specificity compared with other markers. In early gastric cancer group, G-17 demonstrated high sensibility and specificity which were significant higher than other indexes which was consistent with many studies . As Edkins for the first time found gastrin, there were more and more scholars focusing on its activity . Gastrin can stimulate gastric acid secretion; its expression can also be adjusted by acid feedback . Among the many subtypes of gastrin, G-17 plays a significant role to regulate gastric acid secretion [15-17]. A large number of research results confirmed that hypergastrinemia is a risk factor for gastric cancer. Cao et al. an observational case-control study showed that serum G-17 was higher than the control group in gastric cancer patients . Sun suggested the cut-off points of G-17 was 10.7 pmol/l, sensitivity and specificity were 50% and 83% out of a large sample of research data . Japanese researchers found that the function of gastric mucosa can be reflected by the expression of PG in serum . The serum PG can be divided into two subtypes: PG-I and PG-II, which belongs to the aspartic protease precursor, consisting of 375 amino acids, 42 kDa molecular weight. Miki et al. suggested when PG I ≤ 70 ng/mL or PRG ≤ 3, the diagnostic sensitivity was 77% and the false positive rate was 27%, the positive predictive value between 0.77% and 1.25%, the negative predictive value between 99.08% and 99.90% . Finally we study the combined detection of G-17 and PRG value in diagnosis of gastric cancer. Spearman rank correlation method showed that the serum levels between G-17 and PRG is small (P>0.05). All patients with gastric carcinoma, combined detection results of the three indexes showed that G-17 and PRG combined detection of diagnostic sensitivity can be increased to 96.2%. There are some reports on sign gesture recognition and we need to study further [22-26]. However, the results due to the smaller sample size and there are certain limitations, but the combined detection of G-17 and PRG still has the potential to be a reliable indicator of detection of gastric cancer. G-17 and PRG is a high potential for applications in the diagnosis of cancer. G-17 combined with PRG can play a complementary role in the diagnosis of gastric cancer, improving the diagnostic sensitivity of gastric cancer and accuracy. Guggenheim DE, Shah MA. Gastric cancer epidemiology and risk factors. J Surg Oncol 2013; 42: 219-240. Takahashi T, Saikawa Y, Kitagawa Y. Gastric cancer: Current status of diagnosis and treatment. Cancers 2013; 5: 48-63. Senmaru T, Fukui M, Kuroda M. Serum pepsinogen I/II ratio is correlated with albuminuria in patients with type 2 diabetes. Endocrine J 2013; 60: 161-166. Yun L, Bin Z, Guangqi G. Clinical significance in combined detection of serum pepsinogen I, pepsinogen II and carbohydrate antigen 242 in gastric cancer. Hepato-Gastroenterol 2014; 61: 255-258. Mishra P, Senthivinayagam S, Rana A. Abstract 1724: Role of GSK-3beta in gastrin-induced migration of gastric cancer cells. Cancer Res 2011; 70: 1724. Ting W, Lei Z, Yang Y. EGR1 is critical for gastrin-dependent upregulation of anion exchanger 2 in gastric cancer cells. Febs J 2013; 280: 174-183. Hallissey MT, Dunn JA, Fielding JW. Evaluation of pepsinogen A and gastrin-17 as markers of gastric cancer and high-risk pathologic conditions. Scand J Gastroenterol 1994; 29: 1129-1134. Rakic S, Hinder RA, Adanja G. Elevated serum gastrin levels in patients with gastric cancer. J Surg Oncol 1991; 47: 79-81. Mc Ghee A, Sivarajah M, Gong Q. Angiotensin type 2 receptor blockade inhibits fatty acid synthase production through activation of amp-activated protein kinasein pancreatic cancer cells. Surg 2011; 150: 284-298. Zhuang K, Yan Y, Zhang X. Gastrin promotes the metastasis of gastric carcinoma through the β-catenin/TCF-4 pathway. Oncol Rep 2016; 36. Kikuchi R, Abe Y, Iijima K. Low serum levels of pepsinogen and gastrin 17 are predictive of extensive gastric atrophy with high-risk of early gastric cancer. Tohoku J Exp Med 2011; 223: 35-44. Wang W, Seeruttun SR, Fang C. Prognostic significance of carcinoembryonic antigen staining in cancer tissues of gastric cancer patients. Ann Surg Oncol 2016; 23: 1-8. Edkins JS. The chemical mechanism of gastric secretion. J Physiol 1906; 34: 133-144. Smith AM, Watson SA. Review article: gastrin and colorectal cancer. Alimentary pharmacology and therapeutics. 2000; 14: 1231-1247. Cao Q, Ran ZH, Xiao SD. Screening of atrophic gastritis and gastric cancer by serum pepsinogen, gastrin-17 and Helicobacter pylori immunoglobulin G antibodies. J Dig Dis 2007; 8: 15-22. Sun LP, Gong YH, Wang L. Serum pepsinogen levels and their influencing factors: a population-based study in 6990 Chinese from North China. World J Gastroenterol 2007; 13: 6562-6567. Miki K. Gastric cancer screening using the serum pepsinogen test method. Gastric Cancer 2006; 98: 735-739. Sun L, Tu H, Liu J. A comprehensive evaluation of fasting serum gastrin-17 as a predictor of diseased stomach in Chinese population. Scand J Gastroenterol 2014; 49: 1164-1172. Mukoubayashi C, Yanaoka K, Ohata H. Serum pepsinogen and gastric cancer screening. Internal Med 2007; 46: 261-266. Miki K, Fujishiro M, Kodashima S. Long-term results of gastric cancer screening using the serum pepsinogen test method among an asymptomatic middle-aged Japanese population. Dig Endosc 2009; 21: 78-81. Kaluri R, Reddy CP. A framework for sign gesture recognition using improved genetic algorithm and adaptive filter. Cogent Eng 2016; 3: 1251730. Kaluri R, Reddy P. Sign gesture recognition using modified region growing algorithm and adaptive genetic fuzzy classifier. Int J Intell Eng Syst 2016; 9: 225-233. Rishab Jain C, Kaluri R. Design of automation scripts execution application for Selenium Webdriver and TestNG Framework. ARPN J Eng Appl Sci 2015; 10: 2. Kaluri R, Pradeep CH. An enhanced framework for sign gesture recognition using hidden Markov model and adaptive histogram technique. Int J Intell Eng Sys 2017; 10. Kaluri R, Lakshmanna K, Reddy T, Karnam S, Koppu S. A comparative study on selecting and ranking the test cases in software testing. ARPN J Eng Appl Sci 2016; 11.